Heliotrope is the follow up full length to 2005's Lodestar EP. 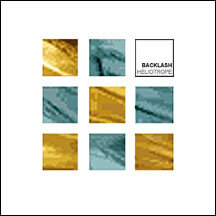 Backlash was formed 1998 in Lidköping, Sweden by Oskar Lygner, Niklas Lundquist and Erik Torstensson. Their sound can be described as pure electronic pop with Erik's smooth vocals gliding over layers of synths, samples and other electronic intricacies. Highlighted by the singles, "Lodestar", "The Wrench of Parting", "Splinter" and the melodic "Unconsciously Astray", Heliotrope is a beautifully crafted and sonically solid release that ventures into areas frequented by Coldplay, The Postal Service and Massive Attack. In addition to the album, the WTII version of Heliotrope features a Bonus CD with 6 exclusive remixes plus the 3 remixes found on the EU release. Hear why Backlash is one of Europe's best kept secrets.